Over the last few weeks, Hungry Bear and I have bought a ton of strawberries from Rodriguez Farms, our favorite strawberry vendor at the Serramonte Farmers' Market. The berries were sweet, juicy and a great value, a flat (12 baskets) was only $14. And their organic berries were just a few dollars more. Needless to say, we've eaten a lot of fresh strawberries lately and needed to make something with them. After pondering what to bake, we decided to turn our amazingly simple blueberry kuchen recipe into a strawberry kuchen. The only changes to the recipe were the substitution of lemon zest and vanilla extract for the cinnamon. The end result was a delicious strawberry pie that was a snap to make. We love the buttery crust of this kuchen. The baked strawberries turned into a wonderful compote and the pie looked beautiful topped with the fresh berries. We served the kuchen with a scoop of vanilla ice cream and the combination was magnificent! SND Note: When cutting in the butter, we just used our hands to squeeze the butter and flour mixture into coarse crumbs. If the strawberries are super sweet, reduce the sugar in step 2 to 1/3 cup. Preheat oven to 400°F (204°C). In medium bowl, mix 1 cup flour, salt and 2 tablespoons sugar. Cut in butter until it resembles coarse crumbs. Sprinkle with vinegar and shape into dough. With lightly floured fingers, press dough into 9-inch springform pan about 1/4 inch thickness on bottom, less thick and 1 inch high around sides. Mix remaining 2 tablespoon flour and 1/2 cup sugar in a medium bowl. Add 3 cups strawberries, vanilla extract and lemon zest and gently mix together with sugar and flour. Evenly distribute strawberries on top of dough. 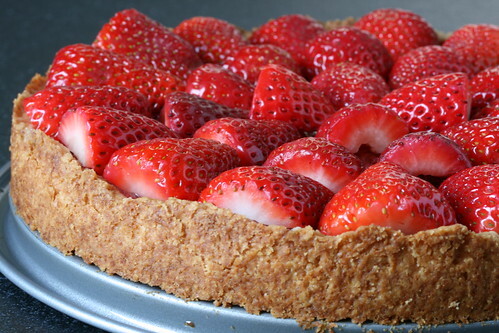 Sprinkle any remaining sugar and flour mixture on top of strawberries. Bake on the middle rack for 40 to 50 minutes or until crust is golden brown and filling bubbles. Remove from oven and place on cooling rack for at least 30 minutes. Arrange the remaining 2 cups strawberries on top. Run a pairing knife around the crust edge to separate from the pan before opening springform. Serve with a scoop of vanilla ice cream. That’s an awesome price on strawberries, I wish I had some of those! what gorgeous berries! at that price, i’d expect some mutated beasts, but they’re perfect! and that kuchen…dang, is my jealousy showing? Brilynn, we’ve gone to a few farmers’ market in the area and the price can’t be beat. Grace, The berries were very good, but we got there late last week and had to take what was left. Usually, we pick and choose and the strawberries are a little bigger and sweeter. Evelin, thanks! When does strawberry season start in Estonia? Looks delicious and easy to make. Would it be a crime to make this with frozen strawberries by any chance? This sounds fabulous! I’m still trying to decide what to do with my berries and I think I’m leaning towards ice cream. But next time I pick some up, I think I’ll be trying this! Yum! i am absolutely dying over the picture of this pie. beautiful! I’ve made this twice in the last week. It was wonderful!!! Annie, using frozen strawberries would be perfectly fine for the filling part, but I’m not so sure how the kuchen would look with frozen berries on top. Nicole, thanks. I’m looking forward to seeing your strawberry ice cream post. Barbara, I’m glad you liked the recipe! First off, this kuchen looks delicious! I am going to make it next Tuesday for our monthly CAKE club at work… some people have sort of been getting more than their fill of chocolate recently (I know – of all the things to complain about) so I thought I would mix things up and this looks perfect. Can’t wait to try it! Second – am I the only one who noticed the hint of photography magic in the slideshow abow? I think it is so cool that once you click on the big photo at the very top, all you need to do is hit the arrow keys to move the pictures… and slides 7,8, and 9 are cool – it’s like time elapsed photography with some sort of strawberry elf intervening in between photos – very cool! I also made this strawberry kuchen this past weekend (along with the blueberry muffins) and I have to admit that I like the muffins better (but the blueberry kuchen the best). I don’t know if it were the extreme heat on Saturday but after I placed the uncooked strawberries on the baked product, it seemed to look like it was macerating in the juices. By the time Eric got home from work (about an hour later), the strawberries were shriveled and the crust became soggy with strawberry juice. I don’t know if I should have waited to put the remaining strawberries on top but after making the blueberry kuchen, I noticed that if I placed them on while it was still hot, the gelatinous mixture would adhere to the uncooked blueberries better. What do you think? i agree, it’s hard to beat the blueberry kuchen. as for the strawberry kuchen, we didn’t have any problems with the uncooked fruit holding up, but we did let the pie cool before placing them on top. anyway, glad you are trying out so many recipes! 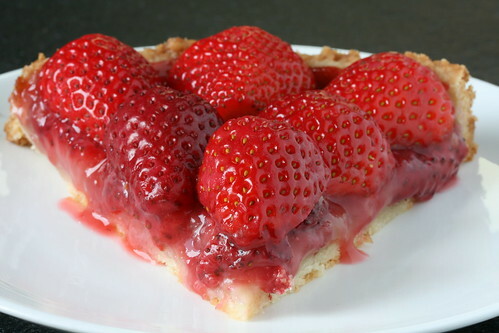 I love strawberries and I love pies so I believe I would love this kuchen. However, I have an huge amount of kiwis in my kitchen, waiting to be used in some delightful dessert, and I wonder if this kuchen would also work well with them, what do you think? Congratulations for SND! And Foodgawker… and Craftgawker!